‘2+2’ talks: Do Russia and Japan prefer status over substance? Russian and Japanese foreign and defense ministers at the ‘2+2’ format talks in Tokyo on March 20, 2017. Although little new substance transpired from the recent Russia-Japan high-level talks in terms of achievements on signed paper, their speedy organization demonstrated that both parties remain committed to maintain the momentum gained in bilateral relations throughout 2016. Over the past weekend Tokyo hosted another round of high-level Russo-Japanese negotiations. On March 18, Russian Deputy Foreign Minister Igor Morgulov and his Japanese counterpart Takeo Akiba discussed joint economic activity on the Southern Kuril Islands, which Japan claims. 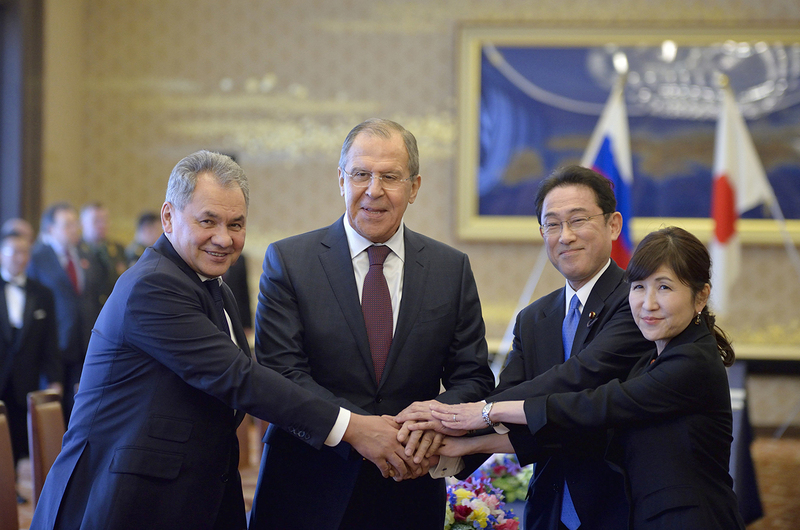 Two days later, the ‘2+2’ consultations brought together Foreign Ministers Sergey Lavrov and Fumio Kishida along with Defense Ministers Sergey Shoigu and Tomomi Inada. Although little new substance transpired from both sets of talks in terms of achievements on signed paper, their speedy organization demonstrated that both parties remain committed to maintain the momentum gained in Russo-Japanese relations throughout 2016. Since the meetings confirmed the date of Prime Minister Shinzo Abe’s next visit to Russia for the end of April – four years after Abe’s 2013 “icebreaker” visit and 11 months since the 2016 “no-necktie” summit in Sochi – it is easy to view ministerial talks as preparatory steps for negotiations between top decision-makers. Neither session was intended as a breakthrough; both effectively continued the lengthy probing of ground. For the Russian government, the meetings show improving ties with a G7 country, despite tensions persisting over Ukraine with the rest of the bloc. Just like Abe’s trip to Sochi in 2016, his planned 2017 visit to Russia is scheduled ahead of the G7 May summit in Italy. In Sicily, the prime minister may again elect to act as an intermediary between Russia and the G7, especially given the fact that till date Tokyo seems to have benefited more than Moscow from the Donald Trump administration. Both rounds of talks did have their distinct values. The consultations on March 18 were the first to actually examine specific proposals – however challengeable they may appear – on joint economic cooperation on the disputed islands. Given their sensitivity, the responsibility for putting these proposals into action will, in all likelihood, become the onus of top leaders. At the ‘2+2’ consultations, resumed after a three-year break caused by the Ukrainian crisis, both Japan and Russia stressed commonalities in global issues, such as combating international terrorism, but traded traditional concerns vis-à-vis each other’s policies in shared neighborhood. A tank seen on Kunashir Island, the Kuril Islands / Vladimir Sergeyev / TASSThe Japanese side reiterated its objections to the deployment of the Russian military on the Kurils, including some of the disputed islands. The Russian side criticized the deployment of anti-missile defense systems in Northeast Asia by the United States – a well-known position. For instance, upon visiting Japan in 2000, Defense Minister Shoigu’s predecessor Igor Sergeyev communicated Moscow’s concerns about the possible deployment of U.S. anti-missile defense systems in the region and its impact on relations North Korea – thawing at the time thanks to the South Korea’s Sunshine Policy. Since then, the six-party talks have been abandoned; while both the attempts to engage and those to deter Pyongyang have apparently failed, given its continued missile launches. In this uncertainty, a regional dialogue between the militaries of Asian countries is of particular value, just like its Russo-Japanese vector. Furthermore, Japan’s term as non-permanent member of the UN Security Council (UNSC) runs out in autumn 2017. Meanwhile, the international response to the North Korea’s missile launches – perhaps, the most tangible immediate threat to Japan’s national security – will require coordination at the UNSC. In this light, the Japanese government is likely to build relationships with all UNSC members, including permanent ones, such as Russia. It has been noted that Japan established the ‘2+2’ format only with a handful of close partners: the United States (since 1960), Australia (since 2007), India (since 2010), Russia (since 2013), France (since 2014), and the UK (since 2015). The degree of institutionalization ostensibly varied with the counterpart country. In the case of the U.S. and Australia the dialogue has been fairly stable, while its further replicating on prospective engagements with other countries, including Russia, showed a rather “on and off” character. A visit by the incumbent Russian Defense Minister to Japan in itself is not a frequent event either. The first official to do so was Igor Sergeyev in 1997, repeating the trip in 2000. In his tenure as Defense Minister, Sergey Ivanov visited Japan in 2003. Shoigu’s 2013 trip to Tokyo for the inaugurating session of the ‘2+2’ dialogue thus came after an apparent 10-year hiatus in the visits by Defense Ministers. In the case of Russia, the ‘2+2’ format may be of particular benefit to Japan not only due to the high level of officials involved but more specifically due to Lavrov and Shoigu’s long-standing tenure in the current Russian political makeup. Lavrov has been heading the Foreign Ministry since 2004 and Shoigu has had a 21-year ministerial career at the Emergencies Ministry prior to becoming Defense Minister in 2012. Furthermore, Shoigu is a domestic political heavyweight, a confidante of President Putin – it has even been speculated in both Russian and international media that Shoigu may be considered as one of Putin’s potential successors. Besides, Shoigu has a prior first-hand experience of bilateral cooperation with Japan. Namely, in the aftermath of 2011 Fukushima disaster, the Russian Ministry of Emergencies then led by Shoigu dispatched two rescue missions counting some 160 people to the affected areas in Eastern Japan. Incumbent Japanese foreign and defense ministers were both counted among potential successors to Prime Minister Abe – at least, until recently in the case of Defense Minister Inada, who has been facing a storm of criticism from the opposition in relation to domestic scandals. From that perspective, Russo-Japanese ‘2+2’ meetings may have a positive side effect of laying groundwork for potential next leaders – unless the recent 10-percentage point decline of the Abe cabinet’s rating entails a drastic reshuffling or a change in policy stance. One noteworthy contextual difference between the first Russo-Japanese ‘2+2’ in 2013 and its resumption in 2017, however, is the significant rapprochement in Russo-Chinese relations that had taken place in the past two years. The 2013 meeting took place a couple of months after what initially appeared as a mutual concern for both Russia and Japan: namely, Xi Jinping’s announcement of the Silk Road Economic Belt initiative in Kazakhstan and of the Maritime Silk Road in Indonesia. The concern was then a shared one – Tokyo’s traditional wariness of Beijing was accompanied by Moscow’s initially cold, if not downright suspicious, reaction to China’s new inroads into Central Asia. However, in 2014, China and Russia signed a jumbo gas deal and from mid-2015 onward have been approaching economic initiatives in Eurasia from the point of aligning the Eurasian Economic Union with One Belt One Road – at least declaratorily. Moscow joined the Asian Infrastructure Investment Bank, while Tokyo did not. In this light, even if wariness of China’s rise is still not completely dispelled in Moscow, is likely to be replaced as agenda material for the Russo-Japanese consultations by the issues on the Korean peninsula and U.S. defense policies in Asia – concerns currently shared by Russia and China. In the grander scheme of things, however, both Russia and Japan remain among key stakeholders in the U.S.-China rivalry. Will Tokyo and Moscow use their respective proximities to Washington and Beijing as currency for bilateral ties? We will know next month, when Prime Minister Abe reconvenes with President Putin and checks on the Sakura (cherry blossom) tree he had planted in Russia four years ago. The writer is a doctoral candidate, at the faculty of Asian and Middle Eastern Studies, St. Catharine's College, University of Cambridge. He has been active in projects involving academics in Japan, Kazakhstan, Uzbekistan and Azerbaijan. Views expressed are personal.